The background to this book, first published in 1986, and its underlying concern lies with those aspects of education which relate to values. Amongst these, moral and social values are often thought of as central, and they are the title’s primary concerns. The study also deals with the value aspects and implications of the major areas of the secondary school curriculum, each dealt with by a relevant specialist in separate chapters. 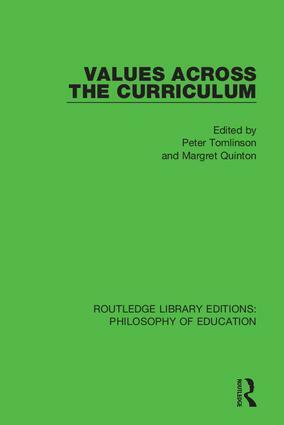 In addition the editors provide a general framework for considering value aspects of the curriculum, and there are chapters on such general issues such as the articulation of aims, the impact of school ethos and institutional influences, and psychological principles for classroom treatment of value questions. This title will be of interest to students of the philosophy of education.